The lot was a little unlovable. The 2-acre parcel sat for a while, unsold and seemingly with little buyer interest, owing to its proximity to Martis Camp’s operations area and the site’s several large rock outcroppings. But where others saw obstacles, architect Ted Brobst of Truckee’s Ward-Young Architects saw opportunity. It turns out that the lot’s position on a cul-de-sac actually provides greater privacy and space than most, with the development’s maintenance area well out of sight and sound. 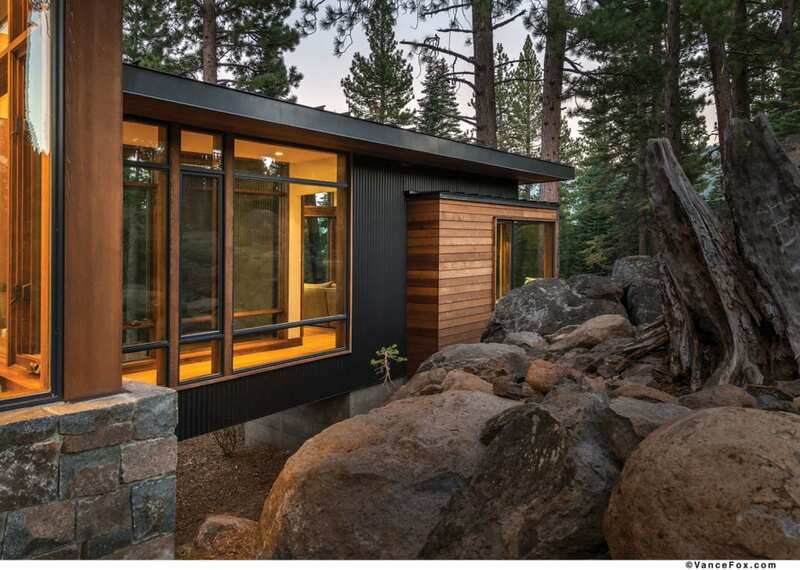 As for the big boulders littering the lot, Brobst bridged those with, well, a pair of bridges, which became a design vehicle for the four-bedroom, four-and-a-half-bathroom mountain modern retreat for a busy Bay Area couple and their two children. 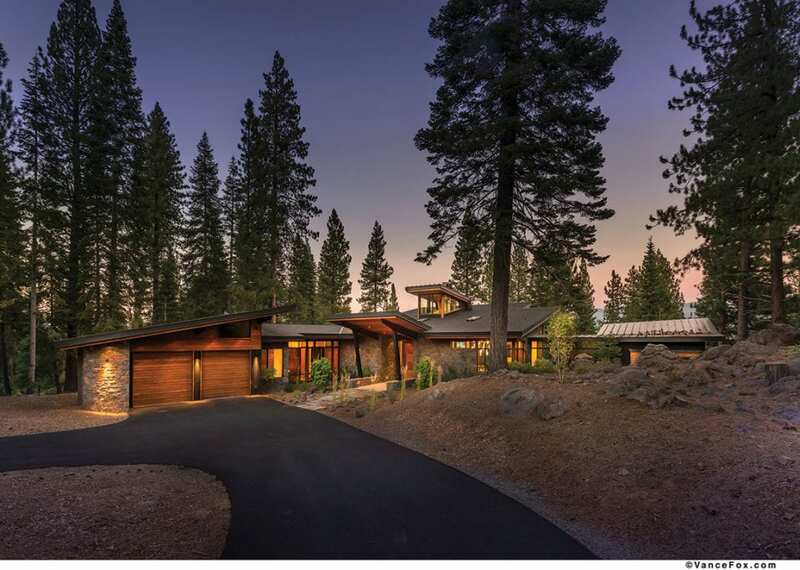 “The future location of the house presented a significant challenge,” says Tony Hardy, whose Truckee-based firm Tony Hardy Construction has been building residential and commercial projects for 30 years. “Ted and the owner wanted to take advantage of the sun and the eastern view of the Carson Range while at the same time nestling the house between two large and very interesting rock outcroppings. For the homeowners, having a blank slate to work from was a real opportunity to think about what they wanted in a house. The bridges, besides helping work the home into the site, assist in the separation of spaces from the large and open main living area. 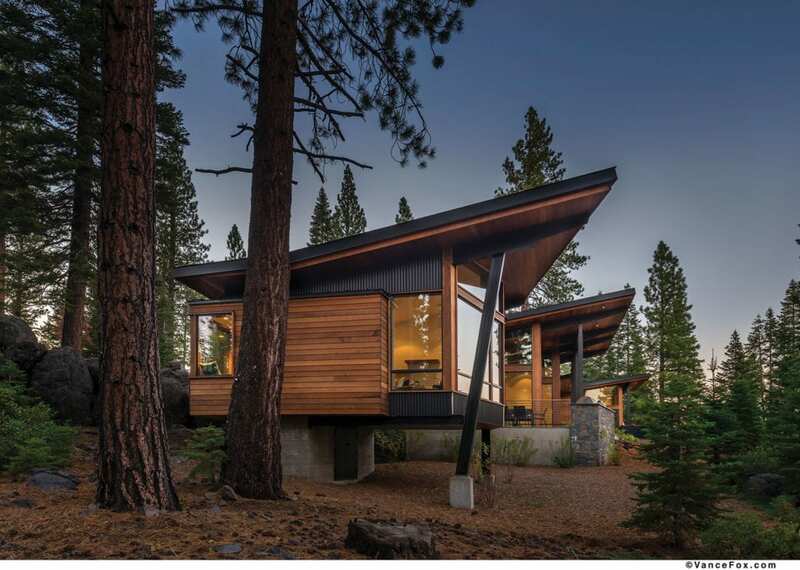 One of the spans, heated and enclosed with glass, leads to the south end of the house, where a family room is nested into the rock outcropping at the front of the lot and raised up into the forest canopy with steel stilts on the back. The angled and smaller-scale room, which can be closed off with a hefty barn door, boasts floor-to-ceiling windows that capture views of Northstar’s Lookout Mountain. Along the opposite wall, a 10-foot run of built-in under-window seating, the velvety blue fabric of which creates a pop of color in the home’s otherwise earth-tone palette, provides another place to lounge and gaze outward. A fireplace with a steel surround provides warmth, and in a nod to technology, here lies the sole television, along with a well-wired set of built-in workspaces for the couple and their kids. The other, opposing bridge is an angled, enclosed and drywalled span above a dry creek drainage feature in the lot’s landscape. 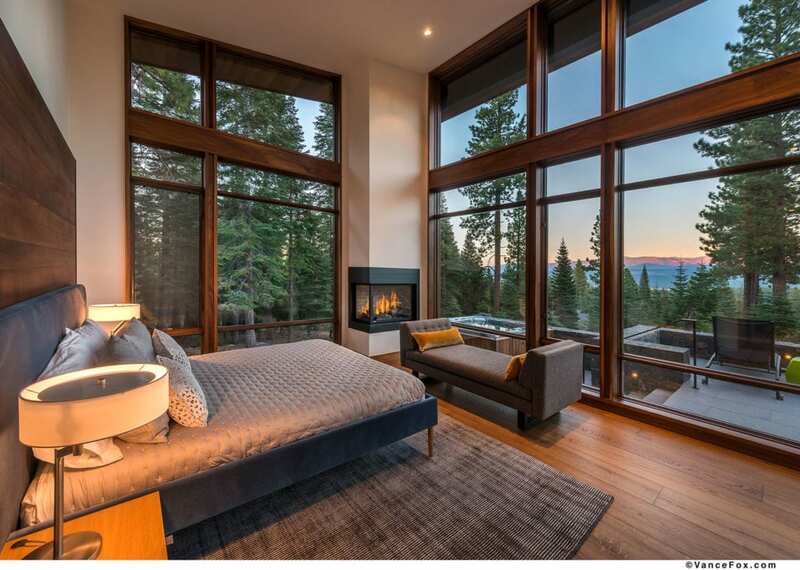 It leads past a guest room and narrows as it rounds the corner to the glass-walled corner master suite with views of the Carson Range. A fireplace and hot tub patio are located just outside. In the master bedroom, a headboard made from layers of wood and fabric and throw rugs that provide a soft landing underfoot are custom crafted. “The owners made many tactile choices, specifying that the fabrics and materials all felt good,” says Shannon Barter, president of Tahoe City’s ID.3 Interior Design. 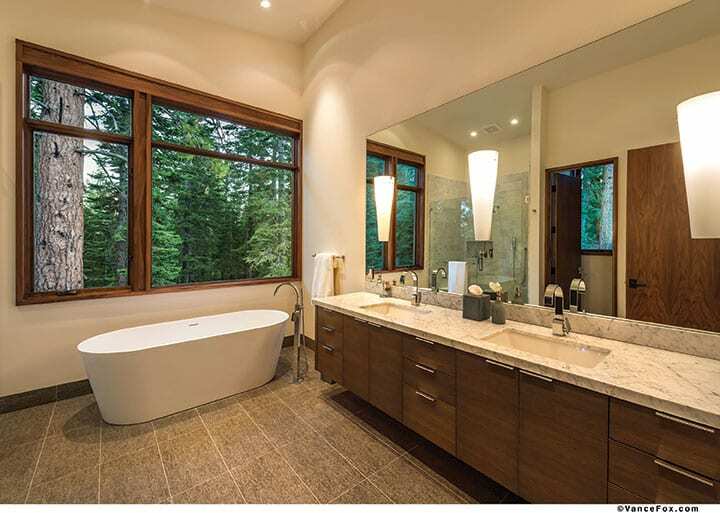 A spacious en-suite bath and closet area boasts a free-standing tub with forest views, a long marble-topped double sink vanity and a durable, stone-like porcelain tile that flows all the way into the curbless shower. And while these intimate spaces are inviting, it is the spectacular and spacious main living area where everything comes together that puts a signature stamp on the home. Upon entering through the hefty walnut pivot front door—built by Gary Collignon of G.C. Construction and Woodworks—the visual greeting is a stunning four-sided see-through fireplace that seems to float in a framework of exposed steel beams and posts and glulams that define the area. Brobst designed the lofty stone and concrete focal point, which also serves as separation between the great room’s living and dining areas; Jimmy Hazel of Reno’s Clastic Designs created the gray-colored concrete hearth, surround and mantle. Clerestory windows allow natural light from above to wash down onto the fireplace and incorporate another angled glimpse of the outdoors. The rear wall of the room incorporates several Weiland lift-and-slide glass panels, providing open evergreen forest views and amazing natural light; the absence of an overhang amplifies both. On the very open terrace outside, plenty of seating is arranged around a square stone gas fire pit. A Big Green Egg ceramic grill, a must-have for barbecue devotees these days, stands at the ready nearby. Back inside, both the cedar boards along the 25-foot-high ceiling and the extra-wide planks of European white oak on the floor, from Nor-Cal Floor Design in Truckee, run along the home’s long axis, further stretching the structure’s long lines. The living room is outfitted with a pair of 10-foot-long custom couches and tables also placed on the long axis, whose dimensions were specified to match that of the great room’s scale. A floating bar is inspired by Danish furnishings. On the other side of the fireplace and chimney, the dining room boasts a long live-edge walnut table fabricated in Canada, from where the owners originally hail. Likewise, the rectangular fixture above the table is from Toronto’s Ridgely Studio Works. 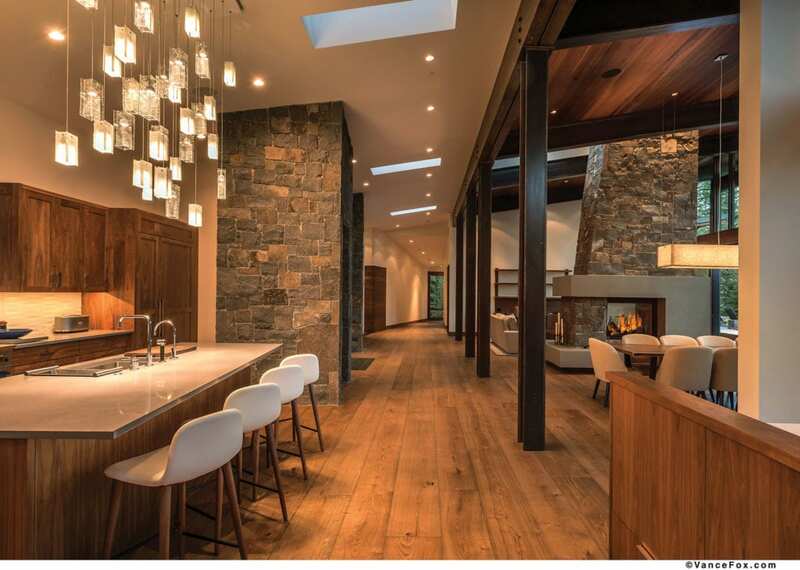 An elegant 150-bottle conditioned and lit wine display case—tucked into an alcove surrounded with black mountain granite from Montana supplied by Sierra Stone in Truckee—provides a visually stunning transition to the gourmet kitchen and does double duty to hide the pantry, refrigerator and microwave. The wavy white backsplash pattern is the Crease In and Crease Out series made by San Francisco’s Heath Ceramics. An ethereal fixture from Shakuff Lighting in Brooklyn, with its 20 individual hand-blown shades made from three kinds of glass, floats above the large Caesarstone-topped island and its four white leather and wood mid-century-style barstools. The kitchen’s walnut cabinets were built by Truckee-based contractor Michael Holman, who made all the cabinetry throughout the house. Trim and doors are also walnut, selected because it boasts a beautiful grain, doesn’t need a stain and has a warm, modern feel, according to both architect and designer. The wood was even used for the range hood, above the blue-colored Bluestar range. An informal breakfast nook nearby with a splash of blue cushions provides additional seating and storage. The bunk room, which sleeps four in two sets of beefy, interconnected built-in beds each with its own nook, light and outlet, was designed by Barter and built by Hardy with an assist from Holman. Doing double duty, the mudroom boasts two sets of washers and dryers. A half-dozen open cubbies are outfitted with compartments featuring wire mesh doors so that air can reach damp items. Benches provide a place to boot up as well as built-in storage beneath. “We interviewed several builders for our project,” says the owner. 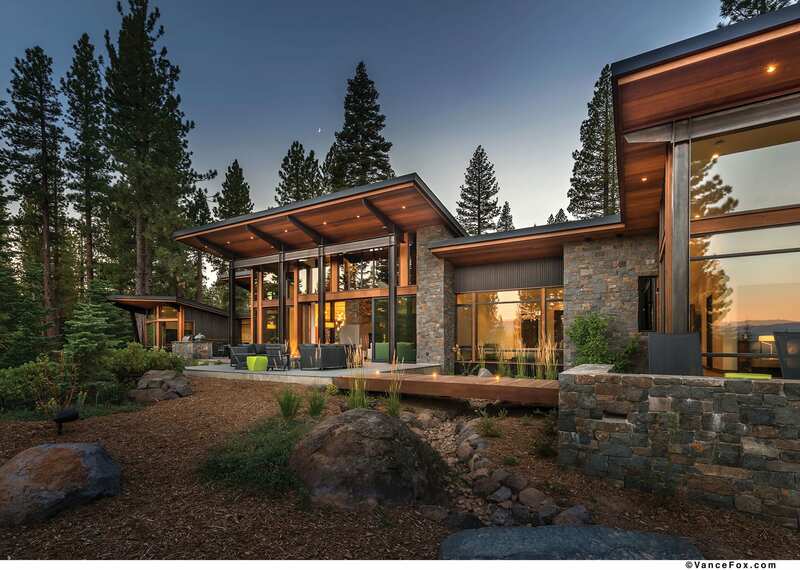 “At the time we started our build there were many homes going up in Martis Camp, and we assumed that many builders were going to take on too much work that could negatively impact timing, budget and quality. When we met with Tony, he told us that he would only ever have three projects on the go at one time and to do anything more would hurt his ability to deliver on time and the quality both we and he expected. Tony impressed us right away with his experience, sincerity and enthusiasm to work with Ted on our project. Ultimately, the highly interactive approach to creating this home worked well for the clients.